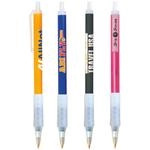 This logo pen features a high end professional look and slotted gripper with your choice of black or blue ink. The Translucent Colored Promotional Pen comes in wonderful colors! Promotional pens are perfect as an all-around giveaway. This Translucent Ballpoint Custom Pen w/ Rubber Grip is an economical giveaway. Choose from fun colored barrels to promote your company.